← A+E Announces Premier of ‘Houdini’ Miniseries Sept. 1, 9 p.m. 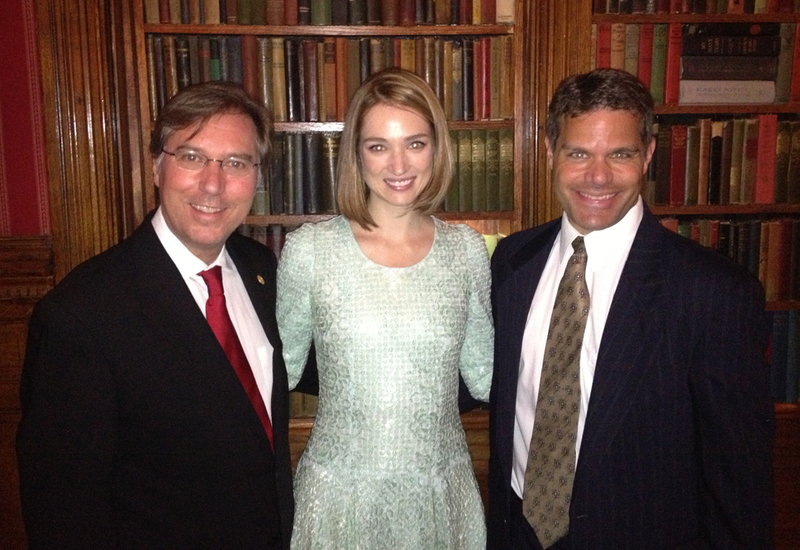 If you read the Interval Magic blog from time to time, you might recall that last year Houdini expert John Cox (Wild About Harry) and I were fortunate enough to have dinner at the Magic Castle with actress Kristen Connolly, who plays Bess Houdini on History’s Houdini miniseries, which premiers this Monday—Labor Day—at 9 p.m. ET/PT. Kristen was nice enough to say some great things about John and me in some of her recent interviews. John wrote a nice piece about that on his blog, but I wanted to include the excerpts here as well. Thanks for these public kudos, Kristen! I did. I’m really, really lucky, because what I started doing was just ordering these biographies, and they’re like 600 pages long each. I was sort of slogging through slowly. But I have a dear friend, Michael Mitnick, who is a writer and a huge Houdini fan. He knows an incredible amount about the Houdinis. I’ve learned that there are a lot of people who are sort of obsessed with the Houdinis and know a lot about them. Michael put me in touch with a man named Tom Interval, who is a magician based in California, and he is a Houdini expert. He put together this packet of information: all the most important things that you could find, extracted from all of these different sources. I can’t even tell you how helpful it was. It was like 30 or 40 pages of material about Bess as a person: how she grew up, anecdotes that people told about her, her relationship with Harry, all kinds of things that were just unbelievably useful to me. I certainly could not have done all of that work in the time that I had without him. I was really lucky in that a good friend of mine, a writer, Michael Mitnick knows quite a lot about Houdini and he was able to put me in touch with his magic teacher, Tom Interval, who is a magician based in California. I went out to Los Angeles and I was set up with Tom and John Cox who runs the “Wild About Harry” blog dedicated to Houdini, that’s just this awesome, wealth of information. Tom put together this amazing packet of all Bess related information. He not only gave me this amazing resource, but saved me countless hours of pouring over all these books for information on Bess’ life. It’s a little bit harder to find stuff on her. There’s just so much written about Houdini and there’s a lot written about Bess, but you kind of have to sift through to find it. I referred to that document constantly while shooting. How familiar were you with Houdini before you took this role? I think a lot of people might have a general idea of who he is, but did you know a lot about his life, his biggest magical acts, or how he died? KC: Not really, no. I knew a little bit: I knew the name, and I knew he was an escape magician. Luckily, I have friend, he’s a writer, Michael Mitnick, who is actually a Houdini expert, and I had no idea about this. But as soon as I got the part — and he’s really close with my brother, Will — and [both] my brother and my fiancé said, “You have to talk to Michael Mitnick, he’s a Houdini expert.” He put me in [contact] with some wonderful information, and then put me in touch with some wonderful people in Los Angeles — John Cox and Tom Interval. John has a blog called “Wild About Harry,” and it’s awesome. It’s in-depth, and has endless information about the Houdinis, especially on Bess. And Tom put together this amazing report for me with all the information about her. It’s harder to find information on Bess; you have to dig through things. So he saved me endless hours of reading every biography out there by putting it all in one place. I was really lucky to have people helping me on getting a handle of who she was. And she’s such a fascinating person, so it was really exciting to do that research. Was the actual performance of playing Bess later in life the same as when you were doing grad school theater? Yeah, it’s the same approach. You do the same homework. You try and find a character and find what makes people do what they do and what they care about and what’s important to them. That process is all the same, just on a much different scale certainly. Yeah, it was a really thrilling job to have and actually a friend of mine from graduate school who was in a class with my mother is sort of a Houdini expert. He’s a writer named Michael Mitnick and he knows tons about Houdini and actually put me in touch with some guys in Los Angeles who are also Houdini experts. So I got some insights thanks to grad school so it kind of came full circle. What did you know about Harry Houdini before getting involved in this project? I didn’t know much beyond the fact that he did escapes. If you had said Houdini to me, the first word that would have come to mind is magician and that’s about it. My research started from ground zero, but I was really, really lucky. I had a friend from graduate school named Michael Mitnick, who’s a playwright, who happened to be sort of an Houdini expert. He was been able to sort of point me in the direction of certain books and of some really wonderful people in Los Angeles who are also Houdini experts. One of them, John Cox, has a blog called “Wild About Harry.” Anyone who’s interested in Harry Houdini should check it out. What did you learn about Bess? Did she really smoke marijuana? She did smoke pot. She drank a lot. There’s much less written about Bess than there is about Harry. But if you are so inclined, you can really dig and find it. I learned an enormous amount from [John]. He was able to tell me what was really substantiated, what was a bit controversial, what some people said but it’s probably not true. This entry was posted in Adrien Brody, Bess Houdini, Celebrities, Film, Harry Houdini, Harry Houdini, Houdini, Kristen Connolly, Portrayals, The Magic Castle, TV and tagged a & e, a+e, adrien brody, harry houdini, history, history channel, houdini, kristen connolly, magic castle, mini series, miniseries, television, tv. Bookmark the permalink.